Tammy Whitehurst is an author, blogger and professional Christian motivational speaker based in Longview, Texas. Tammy loves to encourage and watch women discover JOY found in the truth of God’s Word. She favors all things that fuschia pink and leopard print. Using this embolden styles we designed a logo and brand that would incorporate these elements while still being kept clean and bold. The finishing touch would be famous red glasses that she’s known for and we found a perfect way to incorporate this extra element into her logo and sub mark (secondary logo). We also did a complete re-design of her web site. 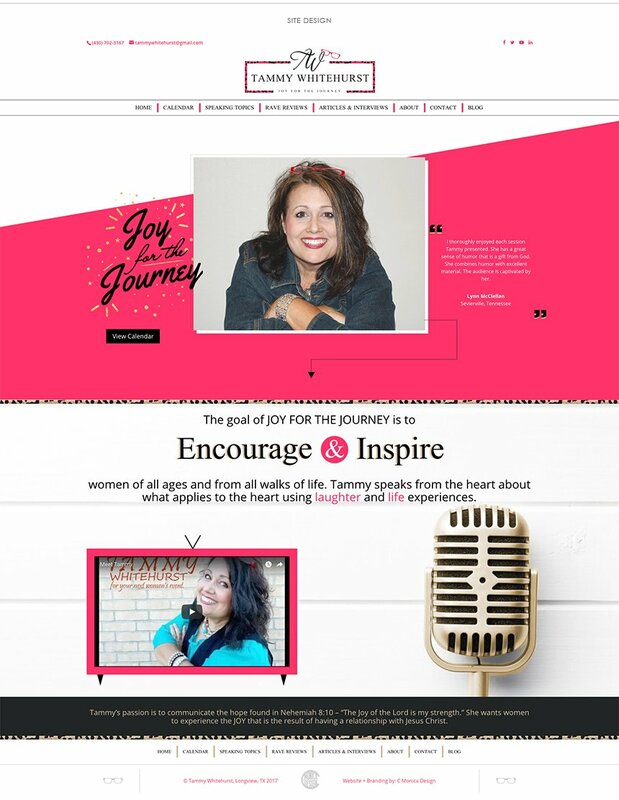 Here we continued in carrying her new brand over by utilizing the bright color palette balanced with the rich blacks and photos of Tammy and finished off with golden accents to take her ordinary web site and professional presence to the next level.